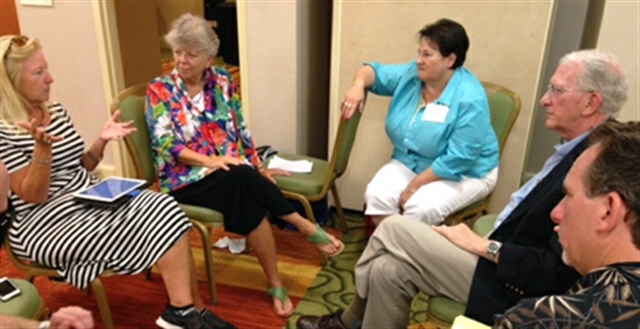 During the recent Mid-Quadrennial Board of Ordained Ministry (BOM) training event held in Denver, annual conference continuing educators participated fully with chairs of BOM, Order of Elders and Order of Deacons, and Fellowship of Local Pastors by the invitation of the Clergy Lifelong Learning office at GBHEM. The purpose of their participation was to find opportunities to work collaboratively and listen to the needs of clergy so that continuing educators may respond more effectively to those needs at the annual conference level. The 35 continuing educators participating in an affinity group at the meeting were excited about empowering our clergy through creative continuing education programs available through GBHEM. These programs include the UMC Cyber Campus; and peer–learning programs like Nurturing Innovative Clergy Leadership, UMC Clergywomen Health Initiative, and Clergy Coach Training.